The American Palladium Eagle coin is the newest addition to the American Eagle program. The bill to create the program was introduced by Rep. Denny Rehberg (R-MT), the representative-at-large from Montana. Montana is home of the Stillwater Mining Company, the only producer of palladium in the United States. Stillwater also owns platinum mines that supply the U.S. Mint with platinum for American Eagle Bullion coins. In the world of metal investing, palladium is behind gold, silver, and platinum in demand. Palladium is not as popular in the United States as it is in other countries. Palladium sells better than silver in Canada and Europe. It is rarer than gold, but a little more abundant than platinum but has the silky look of platinum while being almost as ductile as silver. Artists in Europe and Asia are beginning to use palladium instead of platinum for their higher-end designs. The American Eagle Palladium Bullion Coin Act (Public Law 111-303) originally requested that the secretary study the feasibility of striking palladium coins and mint them if the study shows a market demand. Although the study showed that there is a market, it was not overwhelming. Based on the wording of the law, the U.S. Mint opted not to strike palladium coins. In December 2015, Rehberg added an amendment to the Fixing America’s Surface Transportation Act or the FAST Act (Public Law 114-94, 129 STAT. 1875, see Title LXXXIII, Sect. 73001) that took away the U.S. Mint’s option. The first American Palladium Eagle bullion coins were struck in 2017. The law requires that the U.S. Mint purchase palladium from United States sources at market values. It allows the U.S. Mint to purchase palladium from other sources to meet market demands. A difference between the authorizing law for the American Palladium Eagle and other coins in the American Eagle program is that there is no requirement for the U.S. Mint to produce proof coins. It will be up to the U.S. Mint to determine whether there is a collector demand and strike proof coins accordingly. How this differs from the rest of the American Eagle program will be tested the next time metals experience high investor demand. By law, the obverse of the American Palladium Eagle coin features a high-relief likeness of the “Winged Liberty” design used on the obverse of Mercury Dime. It is an acclaimed classical design as created by Adolph A. Weinman. The law requires that the reverse used to bear a high-relief version of the reverse design of the 1907 American Institute of Architects medal. 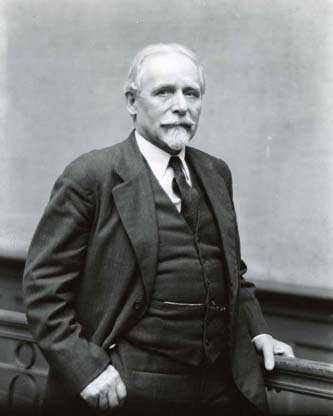 The AIA medal was also designed by Weinman. It is the first time that this design is featured on a legal tender coin. American Palladium Eagle coins are made from one troy ounce of .9995 palladium. The balance is copper. These coins are produced so that each coin states its weight and fineness and has a denomination of $25. The American Palladium Eagle program produces bullion and collectible coins. The bullion coins can be stuck at any branch mint but do not have a mintmark. Bullion coins are sold in bulk to special dealers who then sell it to retailers. They are struck for the investment market. Although some people do collect bullion coins there are not produced for the collector market. As with other investments, American Palladium Eagle bullion coins are subject to taxes when sold and may be held in Individual Retirement accounts. Please consult your financial advisor or tax professional for the tax implications for your situation. 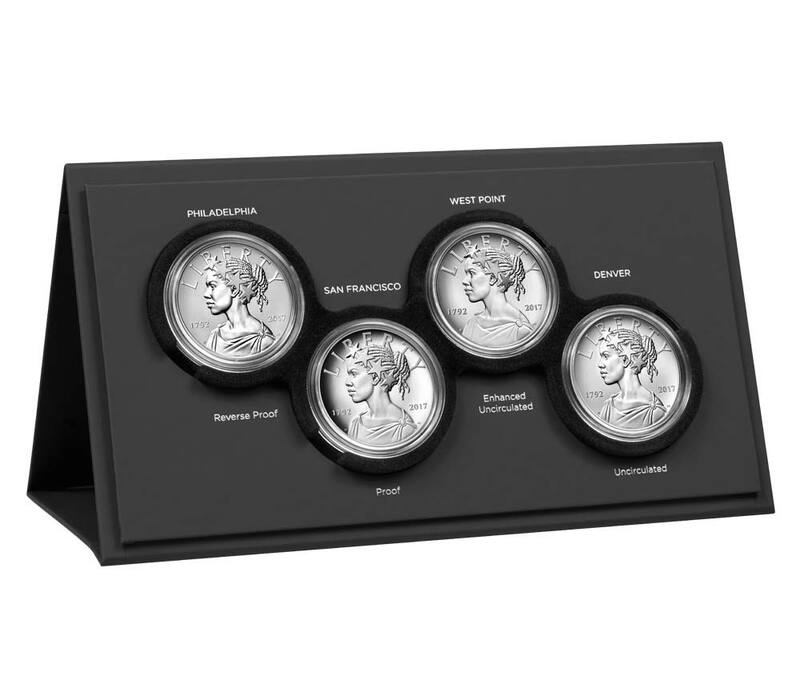 Collector coins are produced and sold by the U.S. Mint in specialty packaging directly to the public. Collectors can purchase new coins directly from the U.S. Mint and find these coins online. Collector American Palladium Eagle coins are produced only as proof coins. The U.S. Mint began selling American Palladium Eagle Proof coins in 2018 with a limited production of 15,000 coins. The coins sold by the U.S. Mint are stored in a specially made capsule and that capsule is placed in a package similar to that used for other coins in the American Eagle program. Since this program is new, there have been no special issues or the discovery of errors. As time passes, that will likely change. Images courtesy of the U.S. Mint. The U.S. Mint published its 2018 Pricing of Numismatic Gold, Commemorative Gold, and Platinum Products table with a range of updated prices for the year. The new table removes the First Spouse gold coins and the Centennial Gold coins that were produced in 2017. Price for the American Gold Eagle proof coin was raised by $17.50 while the one-tenth ounce coin was raised by $2.50 across all price points (averages per troy ounce). The price for the 4-coin proof set was raised by $37.50. The one-ounce American Gold Eagle uncirculated, American Gold Buffalo 24-karat Proof, and American Eagle Platinum proof coins were raised by $20.00 also across all price points. The price will not change for the American Liberty Gold Proof, which will use the same design as the 2017 American Liberty 225th Anniversary Gold Proof. There will be a one-tenth ounce option that will go on sale February 8 now included in the table. If the price of gold remains steady, the opening price is expected to be $215.00. The price for the Breast Cancer Awareness Commemorative “Pink” Gold $5 proof coin will be $6.35 more than the 2017 commemorative gold coin while the uncirculated version will be 25-cents less expensive. You can find the U.S. Mint pricing table here (PDF). Remember, precious metals pricing is not a matter of a table lookup. They use average prices based on the prices set by the London Bullion Market Association (also known as the London Fix Price). You can find the Pricing Criteria here (PDF). Although the U.S. Mint has started shipping American Palladium Eagles, few have been available on the daily market. Most bullion dealers are offering these coins as a pre-sale with the expectation of receiving their coins on or about October 10 for shipment shortly thereafter. Pre-sale prices are averaging $85-200 over the spot price, which is currently $928.00 on the world market. Since the U.S. Mint only sells coins to authorized dealers, those dealers will act as wholesalers down the chain. Each time a coin changes hands, there will be a markup. A coin can pass through a few hands before being offered for sale to the public. And these prices are before the dealers rush to slab these coins. I am sure those grading MS-70 will go for significant premiums! If you are interested in buying the coin, I would recommend shopping around. However, if you have a favorite dealer and there is not much of a difference between an online price and the dealer, you may want to consider supporting your local dealer! Image courtesy of USA Coinbook. Have you bought your Palladium Eagle? Quick update for those interested in the new Palladium Bullion Coin that was sold to authorized purchasers on Monday. The U.S. Mint added a link for the Palladium Bullion Coin to the American Eagle Coin Program web page. The web page provides scaled image of the coin and the design information. If you want to find an authorized seller, the U.S. Mint has a web page to let you find one based on your location. Rather than using the images that were reviewed by the Citizens Coinage Advisory Committee, the U.S. Mint also posted full-sized color pictures of the coins. A quick check of online auctions shows that the American Palladium Eagle coin is averaging $1,100 per coin when buying one graded and encapsulated coin or $1,080 when buying an ungraded coin. Multiple coin lots are averaging between $1,070 and $1,080 each. As I type this, the current price of palladium is $928.73. Dealers are paying 6.25 percent over the spot price (approximately $986.79) plus shipping costs. Graded coins also incur fees paid to the third-party grading service. 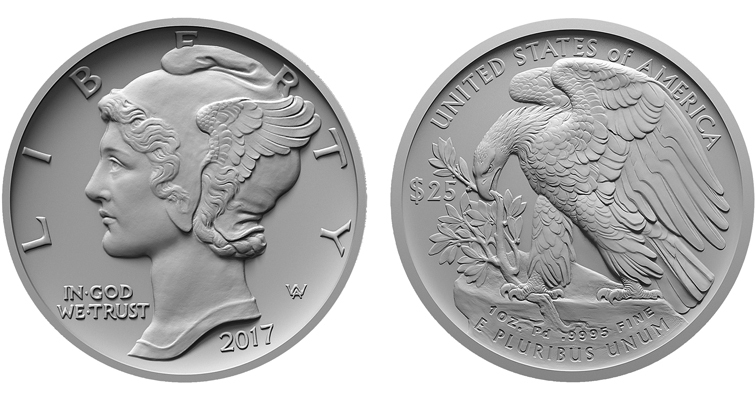 According to reporting by Coin World, the American Palladium Eagles will be released by the U.S. Mint sometime in September. As part of the lame duck session following the 2010 midterm elections, Congress passed the American Eagle Palladium Bullion Coin Act of 2010 (Pub. L. 111-303) telling the U.S. Mint strike one-ounce .9995 fine palladium bullion coins as part of the American Eagle Bullion Program. The coin will have a $25 face value and require that “the obverse shall bear a high-relief likeness of the ‘Winged Liberty’ design used on the obverse of the so-called ‘Mercury dime’” making it yet another bullion coin that will feature a design from the early 20th century. 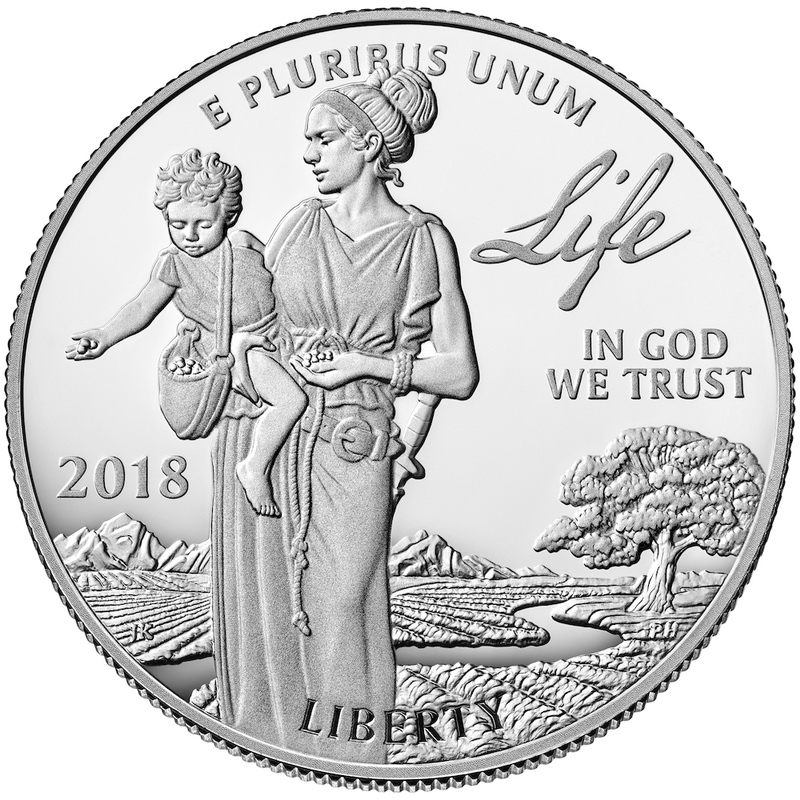 For the reverse, the law says that the coin “shall bear a high-relief version of the reverse design of the 1907 American Institute of Architects medal.” Both the Mercury Dime and 1907 AIA medal designed by Adolph A. Weinman, whose Walking Liberty design is used on the American Silver Eagle coins. The catch to the law was that the U.S. Mint was to perform a feasibility study to determine if there will be market demand. Although the study showed that there is a market for palladium coins, it was not overwhelming. Based on the wording of the law, the U.S. Mint opted not to strike palladium coins. Palladium Eagle coins may have roughly the same impact on the market as the Platinum eagles since palladium is about $100 less expensive than platinum, 69-percent of the price of gold, but 53-times the price of silver. Based on the way the U.S. Mint prices precious metal products, the Palladium Eagle should cost within $100 of the platinum coins. Although palladium is only the fourth metal to have an official ISO currency code (XPD), it is not readily thought of as a precious metal that is used to hedge against financial disaster. Gold (XAU) and silver (XAG) are usually thought of first. Sometimes, platinum (XPT) is part of the discussion, but not as frequently as gold or silver. Palladium does have industrial uses. Because of its ability to absorb hydrogen and compounds with hydrogen, like hydrocarbon, its major use is in catalytic converters used in every gasoline powered vehicle. It is also seen as a key element in the potential of cold fusion because of its ability to absorb hydrogen. It is likely the American Palladium Eagle will be as popular as the Platinum Eagle. Maybe the U.S. Mint will sell more of these coins because they will be slightly cheaper and have a design more appealing to collectors, but neither of these coins will approach the sales totals of the gold or silver version of the American Eagle coins. It is not a coin I am likely to collect. However, I will probably purchase the 2017 coin to have one from the first year of issue just as I did with the 2007 American Buffalo 24-karat Gold Proof coin. Palladium Eagle images courtesy of the U.S. Mint via Coin World. Congress ended the calendar year with a proverbial bang. Aside from actually passing a budget, they passed a comprehensive transportation bill that not only has the possibility of raising our infrastructure grade from a D– to a D (hey… it’s an improvement), but in a few short words will have a big impact on the U.S. Mint. Remembering that technical changes instructs the Office of the Law Revision Counsel how to correct the law, to understand this change we have to look at the law (31 U.S.C. § 5112(v)) to find that this is a correction to the law about minting palladium bullion coins. The American Eagle Palladium Bullion Coin Act (Pub. L. 111-303) originally requested that the secretary study the feasibility of striking palladium coins and mint them if the study shows a market demand. Although the study showed that there is a market, it was not overwhelming. Based on the wording of the law, the U.S. Mint opted not to strike palladium coins. The very first edit is to take away the wording that says to do the study and strike if there is a market to saying that palladium coins will be struck using as much palladium as can be found from United States sources. If there is a higher demand, the U.S. Mint can use sources outside of the U.S. to purchase palladium. Finally, the last correction not only requires the U.S. Mint to strike palladium bullion coins but to also create collector versions. Palladium is a soft silvery metal like platinum. It is lighter than platinum (atomic number 46 versus 78) and similar to silver (atomic number 47). It has similar uses as silver including in electronics, compounded catalysts, jewelry, and coins. Palladium commands a higher price than silver because it is less available but less expensive than platinum, which is more difficult to mine. The primary source of palladium in the United States is the Stillwater Mine in Montana. The mines, which also provides the U.S. supply of platinum group metals (PGM), is owned and operated by the Stillwater Mining Company. The American Eagle Palladium Bullion Coin Act was introduced by Rep. Dennis “Denny” Rehberg (R), Montana’s only member in the House of Representatives. The final entry will discuss how the transportation bill and bad timing will affect American Silver Eagle collectors. Palladium nugget image courtesy of Wikimedia Commons. Other images courtesy of the Northwest Territory Mint.